We started getting calls and emails from an interesting French startup called Babbler a couple of months ago. I agreed to meet with CEO Hannah Oiknine to learn more, as we like to be on top of the latest developments here at Fusion PR. She explained the system, which turns the traditional model of media relations on its head. Rather than assume that media are the quarry, to be hounded by PR, Babbler envisions that press will gladly opt in and connect with brand content online. It seemed like a bold bet. But I was taken by Hannah’s enthusiasm, and the demo was impressive. They’re funded, have built a solid team, and a growing user base in Europe. Babbler now has their eyes on the US market, and recently opened a New York office. I agreed to take a closer look but got caught up in other priorities. 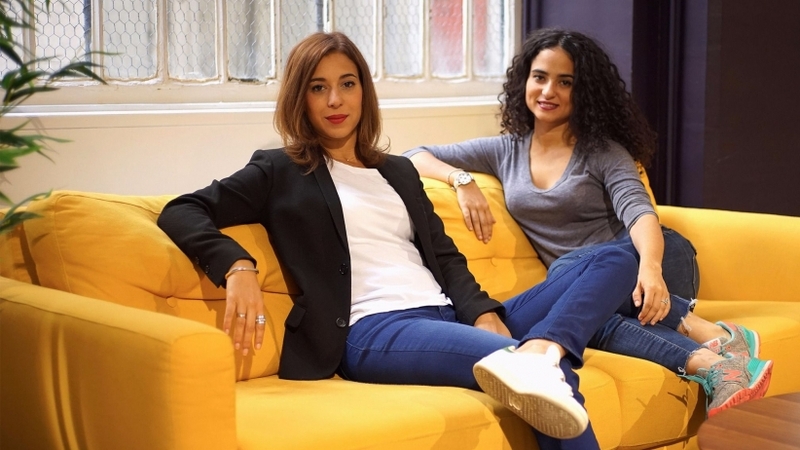 Then, I saw the following headline just the other week: “2 Sisters Raise $2M to disrupt PR Industry.” The news was about more funding for Babbler. It reminded me of the meeting and the inspiration for the system, which sprang from the experiences of Hannah’s sister Sarah Azan (the one on the left), who comes from a PR background. It prompted me to revisit Babbler and gave me the idea for the title of the post, based on the Woody Allen movie. So I got back in touch with Hannah and conducted the following email interview. Babbler rethinks the way companies interact with the press to help them be more successful. We created the only opt-in social media network that lets media and PR pros instantly share news, content and messages in a single platform. We have a matchmaking algorithm that connects brands with the most relevant reporters. Babbler is focused on providing the best engagement tool in the world. By moving PR out of the inbox and into a conversation-driven platform, we are helping journalists and PR professionals connect and engage in a meaningful way. We back this up with powerful reports and analytics, giving your brand the actionable insight to improve your PR Strategy. Thinking “out of the inbox” does sound interesting, but can you really say that the service disrupts PR? Reporters receive hundreds of email pitches / day, and 90% of them don’t match their interests or coverage areas. It is hard to engage them, and they answer only 1% of what they receive. PR pros spend hours filtering lists and updating them, time that could be used to create engaging stories. PR pros are seen as pushy rather than effective sources. It’s way too impersonal and mostly irrelevant! By getting out of the inbox, we simplify interaction, provide a sourcing tool for reporters and the best distribution and engagement tool for PR pros that allow them to create, entertain and engage media communities in a single place. Also, by knowing what engages media communities, PR pros can focus on creating relevant stories for each one they target. Because media don’t all want to same content or to be pitched the same way. Why will journalists opt in? Don’t they already have access to lots of content, and PR connections ? Reporters love Babbler for several reasons. Existing channels don’t solve the problem; emails are not opened or targeted, B2C social networks are not dedicated to PR / media pros and don’t allow you to build conversations exclusively with the press, exchange files or measure the press engagement. With Babbler, the press can choose to follow PR pros/ brands/ agencies they are interested in, ONLY. For free, 24/7. But they can also request information, download files they need or directly chat if they have questions. We built dedicated features for both communications and media pros to help them communicate in a smarter way. For example, reporters can post a PR request or book an interview in just one click! This entry was posted in PR Tech, Public Relations, Tech, Tech PR and tagged media relations, PR, PR tech. Bookmark the permalink.